A branched polymer is one that contains a large number of branches connected to the main chain of the polymer. A branched polymer is one of the structural classifications of a polymer. Others include Linear Polymers, Cross-linked polymers, and Crystalline or Amorphous polymers. 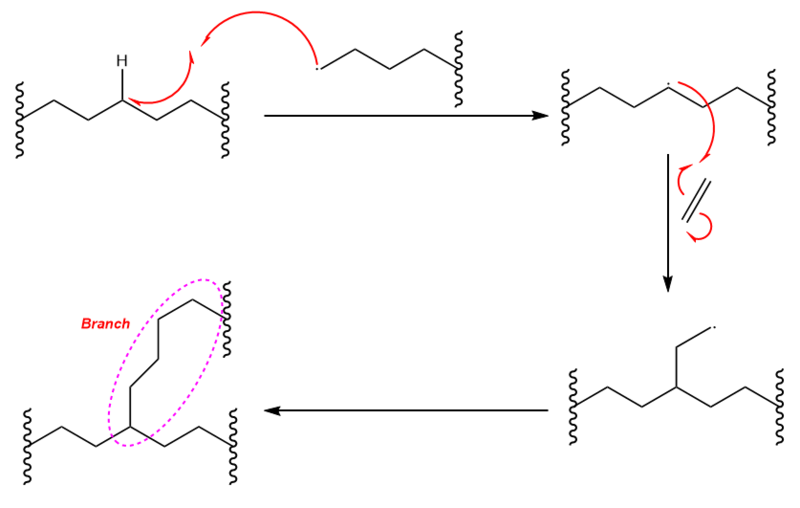 Typically, a branched polymer is formed when the growth point is moved during the polymerization process. This means that a substituent (e.g. a hydrogen atom) on a monomer subunit of the main polymer is replaced covalently by another bonded chain of the polymer. Branching may, therefore, result from the formation of carbon-carbon or various other types of covalent bonds.Branching may also occur by ester and amide bonds. this is typical via a condensation reaction, producing one molecule of water (or HCl) for each bond formed. Since the properties of a polymer are strongly affected by their molecular weight and their chain structure. Branching effects on a polymer depend on the number and length of the branches. For example, short branches they reduce the amount of crystallinity whereas long branches undergo side chain crystallization and are able to form lamellar crystals. Branched polymers have more compact and symmetrical molecular conformations and even a small amount of long-chain branches can significantly improve the mechanical properties of the polymer. The degree of branching and the length of the branches also affect the density of the polymer. Typically, the higher the density of the polymer the higher the degree of crystallinity and the stiffer, harder, and stronger the polymer.